Donald Glover scored that name off a Wu-Tang name generator. His entire shtick was supposed to be tongue-in-cheek irony. Comedian first, music man second. He’s had hits, for sure. “3005” and “Crawl” both landed in the top 100 on the Billboard charts. The guy is Grammy nominated. But there was still a kind of feeling in the air (no Beanie Sigel) that he was still working something out in his head that hadn’t quite materialized. All that was thrown out the window last night at the Institute of Metaphysics in Joshua Tree, Calif. A desert oasis bathed in blue light, one guided by the content team at Wolf+Rothstein. 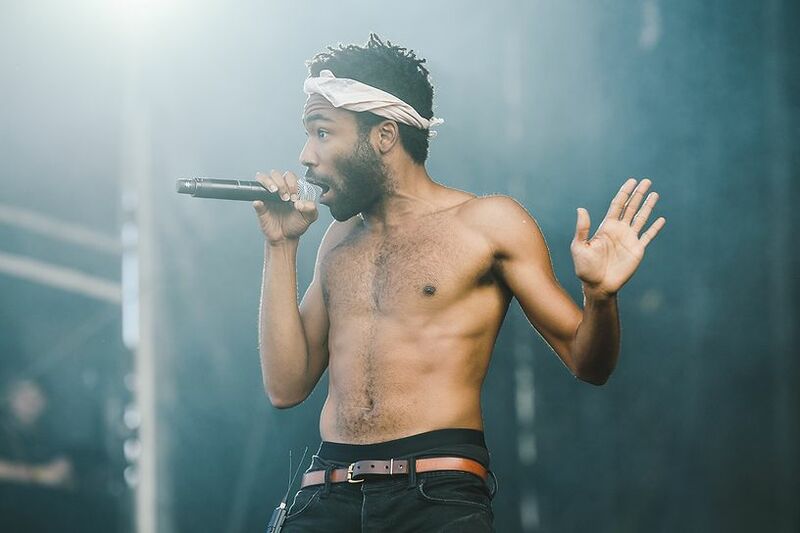 The beast had two ends: an amphitheatre on one side hosting early episodes of Glover’s upcoming TV show Atlanta, and the 60-foot high, 150-foot wide domed stage where Gambino would be giving you a live look at his new record. It’s fascinating what a crutch this tech has become for us. A symbol of our shared loneliness; we moribund travelers on a planet not quite ours. We live under crushing regimes of debt, promise, and information. The threat of FOMO is everywhere. All linked to our cell phones. Our “modern” lives. So “Pharos” sought to give us some solace. The app’s guidebook states, “A unified human intention is now possible due to accelerants such as the internet. A recognition of “we cannot know everything” by every individual can be made.” The tribal aspect of the costume and show visuals seems to suggest Gambino is rejecting our constant need to be connected to our phones and the web. He’s not the only one. Companies like JetBlue and Cathay Pacific have gone so far as to fund “unplug and unwind” campaigns. And a recent white paper shows that some 93% of Millennials use their phones in bed. While 40% of use phones in the restroom. So “Pharos,” which is literally a lighthouse built off the coast of Alexandria in Egypt by Ptolemy II in around 280 BC, is meant to be a beacon for those who want to shift away from the technosphere. Who no longer want to be distracted by technology. As you made your way into the dome, the ceiling glowed of a night sky with dotted stars. We gathered together, as I assume tribes of humans still do. No selfies could be taken, so everyone assumed an air of chill. No one’s face glowed with their very own phone booth of incandescent light. Gambino starts the show with a flourish, dressed down in glowing tribal body paint and a grass skirt, he rushes the stage to a soul-punk number. Instinctively, everyone’s hands go up and begin to pulsate in unison. The entire show was a fever. There was barely any rapping at all. Just singing (howling, really), a big band fusion of funk, soul, rock, punk, and world music with Gambino at the front. Each song rattled off with visuals on the ceiling to match. Ghostly tribal elders shook in a kitschy shimmy. Planets grew enormous, seeming to barrel toward you before exiting down the curved sides. Lynette Williams on keys seized with purpose as her lush ‘fro gave the entire congregation life. And, somehow, Gambino stood out on that ledge like a hurricane, giving us Parliament Funkadelic on one song and Earth, Wind & Fire on another. The choir rollicked as fake lightning lit up the false sky. The guitars hummed. It was vision of the future of experiential music, featuring incredibly well-done music of black-art-past with a modern twist. A way lighted by Childish Gambino and Ludwig Goransson, specifically. It was one of the best live visual performances we’d ever seen. But, more than that, “Pharos” acted both as a glimpse into the future of how to hear an album, and as a watershed moment in how artists may choose to convey their music to listeners. In fact, “Pharos” is an order of magnitude above a mere surprise release. And will force everyone to rise to the insanely high bar he’s set with this music, concept, and experience.